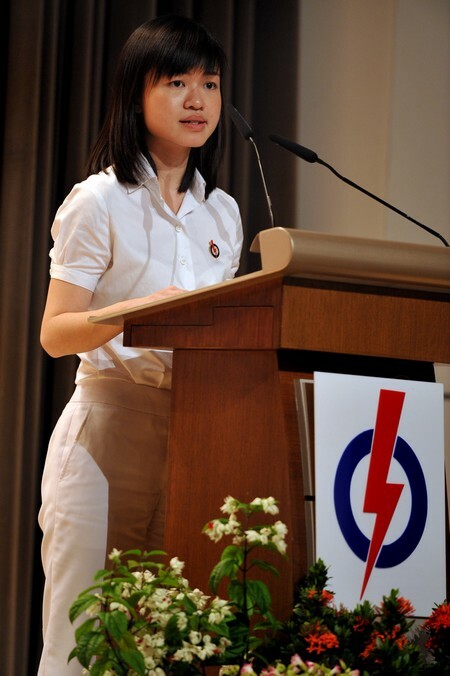 SINGAPORE - When she was elected MP in 2011, Ms Tin Pei Ling left her job as a consultant in Ernst & Young, to give full attention to her work as an MP. Her decision then came somewhat as a surprise considering full-time MPs, particularly from the ruling PAP party, was not common. 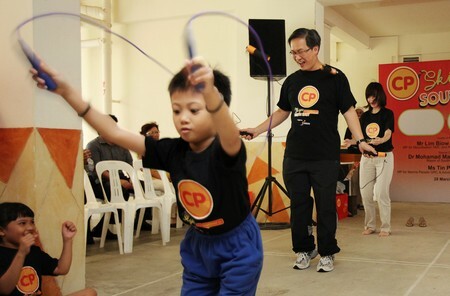 Mr Ang Mong Seng served as the first full-time PAP MP for Bukit Gombak Single Member Constituency from 1997 to 2001. Now, besides Ms Tin, two other PAP MPs serve as full-time Members of Parliament. They are Tampines GRC MP, Mr Baey Yam Keng and West Coast GRC MP, Ms Foo Mee Har. For Ms Tin, as a new MP and the youngest one in parliament, it was important for her to dedicate her attention fully to a single task. "I thought that it is only the right thing to do, to dedicate more time, to understand the ground, to get to know the residents, to really have a better grasp of the issues that my residents face here. And also at work, I felt that if I had to spend more time on the ground, then potentially there would be an impact on my boss and also my colleagues. But between the two, I had to make a choice and I chose to dedicate myself to MacPherson." "I am much more familiar with places and I've known a lot of people, a lot of residents, and some I would say that we have a special bond with quite a number of residents here. I regard them as my family members, like just now you saw some makciks, they're like neneks to me and it's a very special bond that I feel. So I really cherish this." 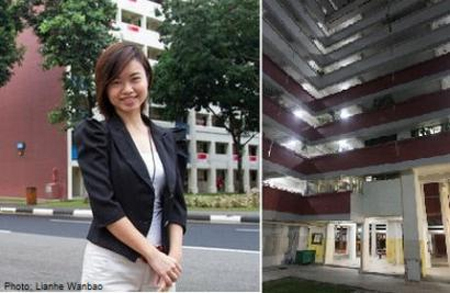 Since 2011, Ms Tin has not only been able to understand the issues and her residents in Macpherson better… in fact since the area has her undivided focus, she has also managed to be more actively involved in introducing a variety of community projects. "So for the senior citizens, before the EASE programme (Enhancement for Active Seniors), we actually had a "Say no to fall" (programme). This really came out from what we saw, what we observed, what we heard from elderly residents. As you know, falls are something that pose a great risk to the elderly in terms of their quality of life. Therefore, we managed to pool together some community partners to deliver this project, this outreach programme for the elderly." "In terms of youth and children, we also have… I set up this MYDream team, which means MacPherson Youth Dream team, it also means MYDream team, MY as in the youth, their own dream. It's something we want them to own. It's really a platform for them to come together and take ownership of the community. They have so far been very cohesive. They're very enthusiastic, very energetic and very creative. They have put together quite a few community initiatives to inject a new energy, a sense of vibrancy into the community." 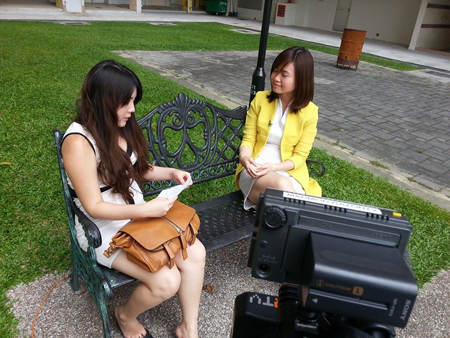 Much has been achieved since Ms Tin became a full-time MP three years ago. However, she acknowledges there are merits for an MP to have a career as well. Today, MPs have to remain relevant and updated about the issues and challenges affecting other communities in their professional sectors. "You get to keep yourself updated, keep yourself relevant, and also you are in touch with other communities as well, so you have a full grasp of all the issues that Singaporeans face." The issues that an MP has to deal with has increased, along with the demands of the people. Being an MP today requires more time and energy. Being a full-time MP has benefitted her, but it is not the absolute solution to fulfilling the needs of citizens and helping them solve increasingly complex issues. Thus, Ms Tin has not ruled out the possibility of going back to work one day. "If there is a chance, if there are jobs that would offer flexibility, I may consider it as well. 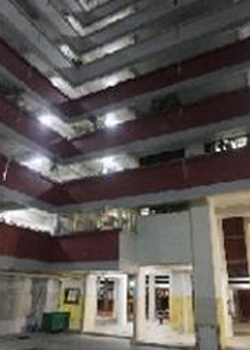 But of course, my first priority is to make sure that MacPherson, my residents, are being taken care of." She explains how she 'discovered' soiled sanitary pads lying on the floor. 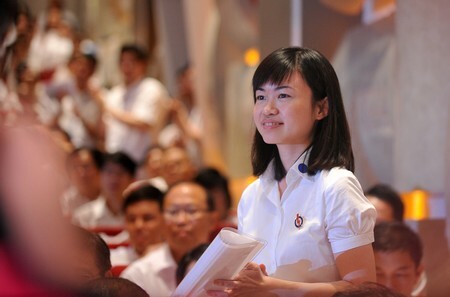 Tin Pei Ling, the youngest People's Action Party (PAP) candidate for the coming general election, speaking at the Young PAP's 25th Anniversary celebrations at NTUC Centre on 17 April 2011. 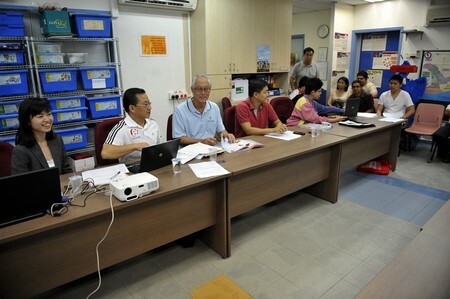 The People's Action Party (PAP) team for Marine Parade GRC (from left) Ms Tin Pei Ling, Mr Seah Kian Peng, SM Goh Chok Tong, Brigadier-General (NS) Tan Chuan-Jin and Dr Fatimah Lateef holding a strategy meeting with party activists at the PAP Marine Parade branch office on 22 April 2011. 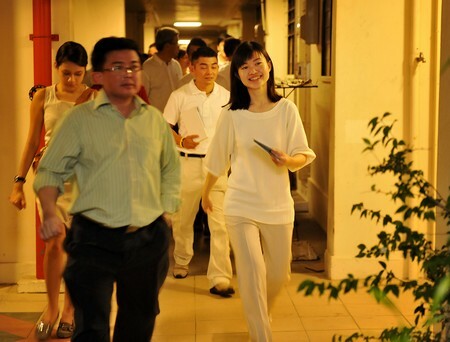 Tin Pei Ling goes on house-to-house visit in a HDB block at Aljunied Crescent on 25 April 2011. 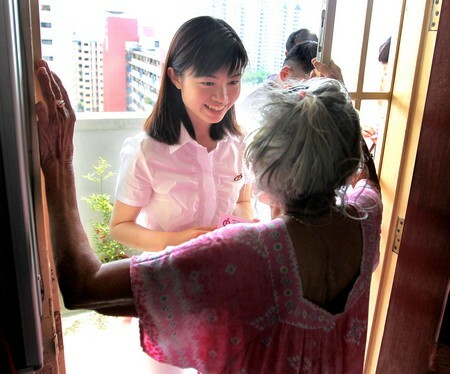 Tin Pei Ling talking to resident Goh Lian Choo, 76, during a house-to-house visit in a HDB block at Aljunied Crescent. Tin Peh Ling went on a walkabout in Macpherson on 30 April 2011. A resident's child clings on to Ms Tin, refusing to let go. 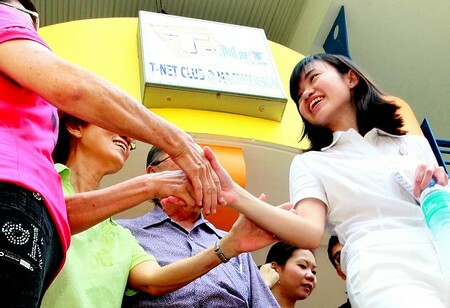 Tin Pei Ling, People's Action Party's youngest candidate, went on a walkabout in Macpherson on 30 April 2011. At her home, a condominium unit in Telok Blangah on 30 April 2011. Carrying a pail of water, to water the plants in her balcony. Greeting patrons at a hawker centre in Block 89, Circuit Road on 3 May 2011, during a walkabout with then Senior Minister Goh Chok Tong. 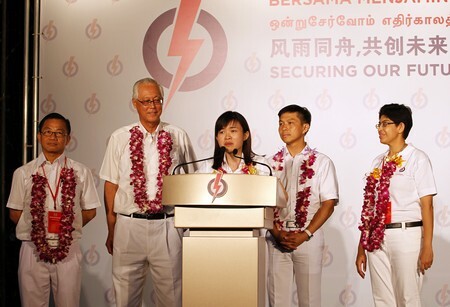 Speaking during a press conference at the PAP’s Marine Parade Branch on 5 May 2011. People’s Action Party’s Tin Pei Ling cast her vote at Telok Blangah Rise. She arrived holding hands with her husband Ng How Yue, who is principal private secretary to Prime Minister Lee Hsien Loong. 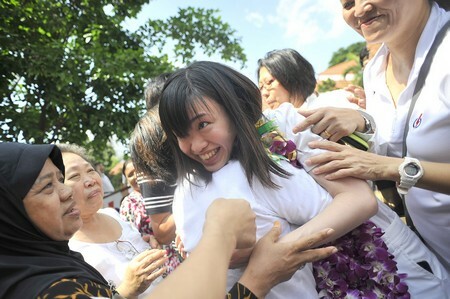 Hugging a resident during her celebratory tour in Marine Parade GRC on 8 May 2011. Residents chatting and joking with Ms Tin during a Meet-The-People session on 7 May 2012. 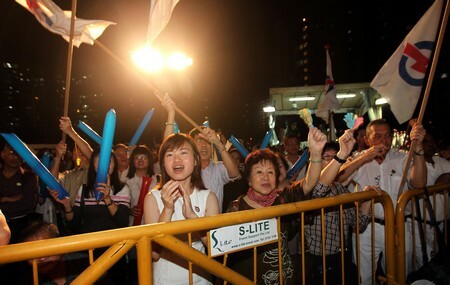 Ms Tin and other supporters at the final PAP rally for the Punggol East by-election on Jan 25, 2013. Ms Tin stopping at a stall set up by a group of Thai students selling the traditional dodol dessert during the Young Entrepreneurs Skills Competition at the HDB Hub in Toa Payoh Central on 7 July 2013.